Aaron Thompson brings the ball up the court. Thompson and the Bulldogs host Northern Illinois on Dec. 8. Jimmy Lafakis/Collegian file photo. After a comfortable victory over the Brown Bears, the Butler men’s basketball team welcomes the Northern Illinois Huskies to Hinkle Fieldhouse. Here’s what you need to know heading into the matchup. When: Dec. 8, 4:30 p.m.
Northern Illinois’ offense runs through preseason All-MAC West selection Eugene German. The junior guard already has two 30-point games this season and is averaging 21.8 points per contest. 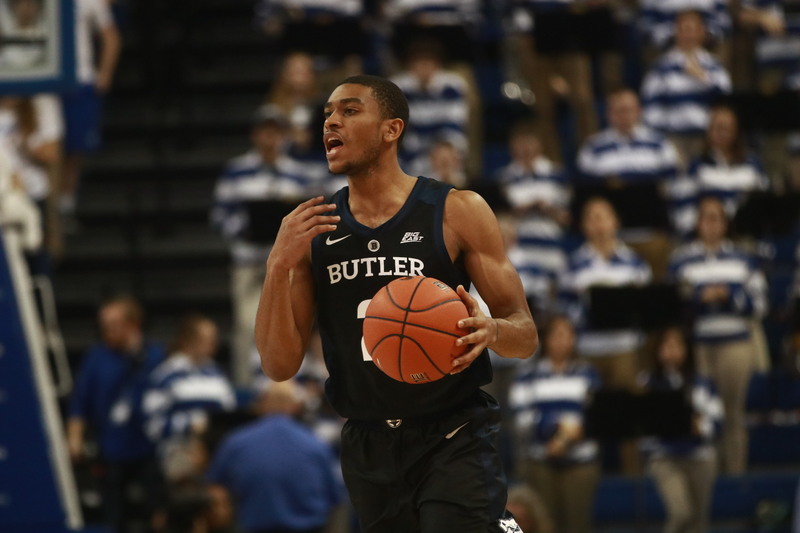 German will hurt the Bulldogs from deep if Butler’s perimeter defense is lacking, as he’s shooting 44 percent from beyond the arc this season. Butler has done a solid job against the highly-skilled guards on their nonconference schedule, but German might be the best one. Behind German’s 21.8 points per game, the Huskies enter Saturday’s matchup ranked 51st in the country in scoring. By itself, that number is not that big of a deal but the Bulldogs have not played a team with an offense currently inside the top 90. The Huskies are, in theory, going to put more pressure on this Butler defense than it’s seen so far this season. On the other end of the court, the Huskies aren’t exactly a lockdown defense, giving up 71.4 points per game and are ranked 181st in that category. The Bulldogs’ defense has been solid even when their offense has struggled, but it is going to be put to the test this week. Kamar Baldwin had his worst game in a Butler uniform against Saint Louis. He followed that game up with 12 points on 5-of-12 shooting in Butler’s win over Brown on Dec. 5. Better, but certainly not where he needs to be. Ultimately, this Butler team will go as far as Baldwin will take it; the Bulldogs can’t be successful without him playing well. Now, they might be able to get away with a win against the Huskies if he has another poor performance. However, Butler has teams coming up on their schedule that it will struggle against if he struggles. Baldwin’s still averaging 17 points per game, but look for him to continue to improve after his less-than-stellar last two outings.